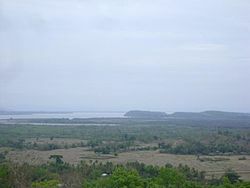 Ramree Island (Burmese: ရမ်းဗြဲကျွန်း; also spelled Rahmee Island) is an island off the coast of Rakhine State, Myanmar (Burma). The area of the island is about 1,350 square kilometres (520 sq mi) and the main populated center is Ramree. The island is separated from the mainland by a narrow canal-like strait, which is only 150 metres (490 ft) wide in average. There is a bridge over the strait connecting the island with the continental shore. The highest point is Zikha Taung, a 305 metres (1,001 ft) high hill located near the western shore in the southern part of the island. There are mud volcanoes present on the island. Sagu Kyun is a 5-kilometre (3.1 mi) long and 4-kilometre (2.5 mi) wide island located off the southern cape of Ramree, separated from it by a 2.4-kilometre (1.5 mi) wide strait. Magyi Kyun is a 2.2-kilometre (1.4 mi) long islet off the southern end of Sagu Kyun. Cheduba Island lies further offshore, about 10 kilometres (6.2 mi) from the south-western coast of Ramree Island. During World War II the Battle of Ramree Island was fought during January and February 1945, as part of the British 14th Army 1944/45 offensive on the Southern Front of the Burma Campaign. At the close of the battle, Japanese soldiers were forced into the marshes surrounding the island, and saltwater crocodiles are claimed to have eaten 400 (or 980 of them, as only 20 survived according to one account) — in what the Guinness World Records has listed as "The Greatest Disaster Suffered [by humans] from Animals". However, the veracity of this story has been disputed and the facts suggest that, while a small number of Japanese soldiers were likely killed by crocodiles (the only verifiable mention is of 10-15 men killed by crocodiles while crossing Min Chaung creek near Ramree town), the vast majority likely died due to a variety of other reasons including dehydration, drowning, British gun-fire, dysentery, and perhaps even a small number to sharks as well (Platt et al. 1998). Saltwater crocodiles were still common in the Ramree Island region up and into the 1960s, but the region no longer supports a viable population of crocodiles, likely due to hide-hunting, and by the early 1980s evidence suggested only scattered individuals remained. Ramree Island is also the location of a proposed gas pipeline system to be built on the Indian Ocean coast to the province of Yunnan in China. From a deep water port to be completed on Kyaukphyu in Rakhine State and from Ramree Island, oil from the Middle East and gas from Myanmar's ocean coast will be transported through the pipelines to China. The pipelines will enable China to rely less on ocean-transported oil and gas through the treacherous Strait of Malacca and will also cut two weeks off the potential transport time. 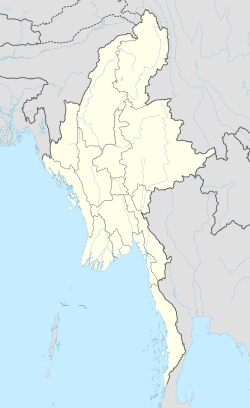 The pipeline transport fees will be a source of revenue for the Burmese government, on top of the sale of the gas. Construction began in 2011. The Myanmar section of the gas pipeline was completed on 12 June 2013 and gas started to flow to China on 21 October 2013. The oil pipeline was completed in August 2014. ^ sources and more details here.